SCORED BY SIDNEY CROSBY IN GAME 6 OF THE 2009 EASTERN CONFERENCE QUARTERFINALS AT the wachovia center IN philadelphia. 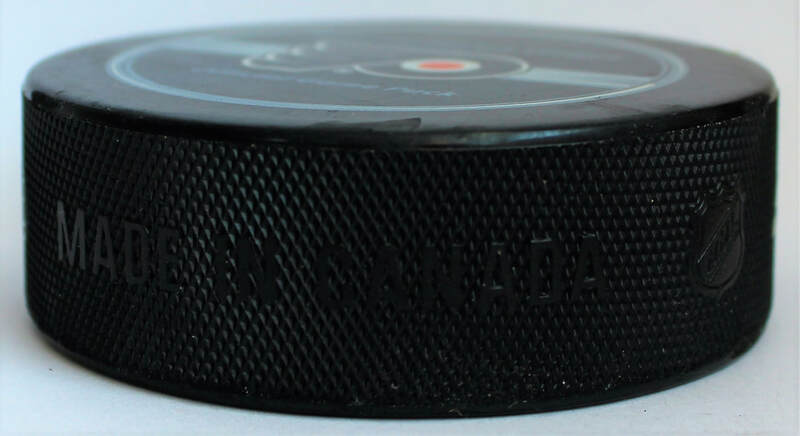 The Penguins met the hated Philadelphia Flyers in the 2009 Eastern Conference Quarter-Finals, a rematch of the 2008 Eastern Conference Final that the Penguins won four games to one. The Penguins won Games 1 and 2 in Pittsburgh to take a commanding 2-0 series lead before dropping Game 3 in Philadelphia and then put the Flyers on the brink of elimination by winning Game 4 in Philadelphia, 3-1. After the Flyers won Game 5 in Pittsburgh, 3-0, the Penguins went into Philadelphia looking to move to the Eastern Conference Semifinals for Game 6. 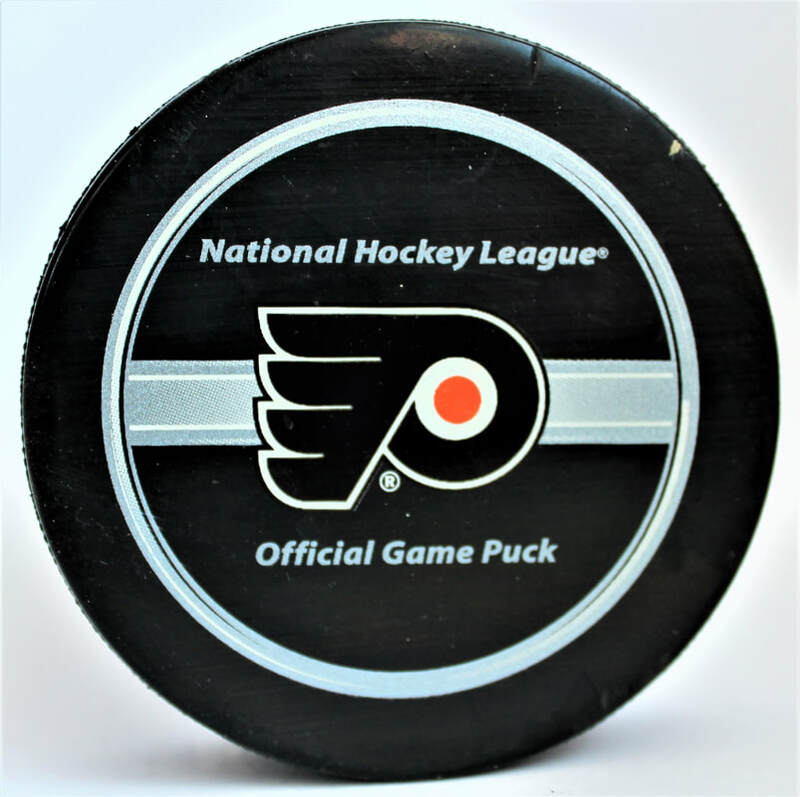 The Flyers went ahead 3-0 in Game 6 just 4:06 into the second period and the series appeared to be headed to a deciding Game 7 back in Pittsburgh. 15 seconds later Max Talbot dropped the gloves with Daniel Carcillo and "shushed" the Philadelphia crowd as he headed to the penalty box. Ruslan Fedotenko and Mark Eaton scored at 4:35 and 6:32 of the second period, respectively, before Sidney Crosby tied the game at 3-3 with 3:01 left in the second period. Sergei Gonchar scored 2:19 into the third period before Sidney Crosby buried the Flyers with an empty net goal with 27 seconds left in the game on an incredible play in which he backhanded the puck off the Flyers net before retrieving the puck with one hand, came around the net to the other side and flicked a back-hander into the Flyers' net. 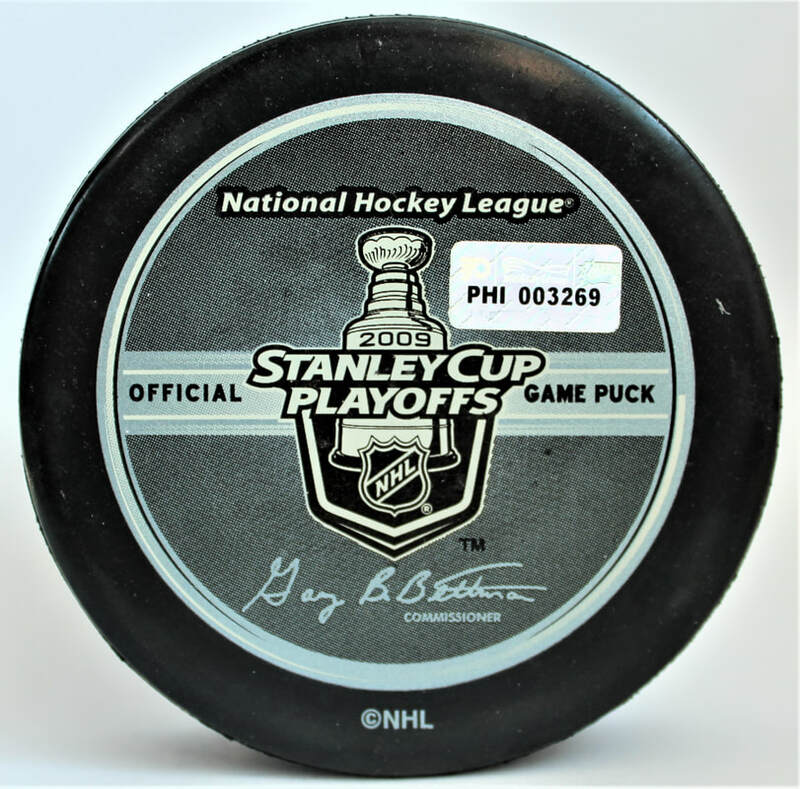 This puck was scored by Sidney Crosby at 19:33 of the third period in Game 6 of the 2009 Eastern Conference Quarter-Finals at Wachovia Center against the Philadelphia Flyers. The goal was Crosby's fourth of the 2009 Stanley Cup Playoffs and 13th Stanley Cup Playoff goal of his career. The even-strength empty net goal was unassisted. 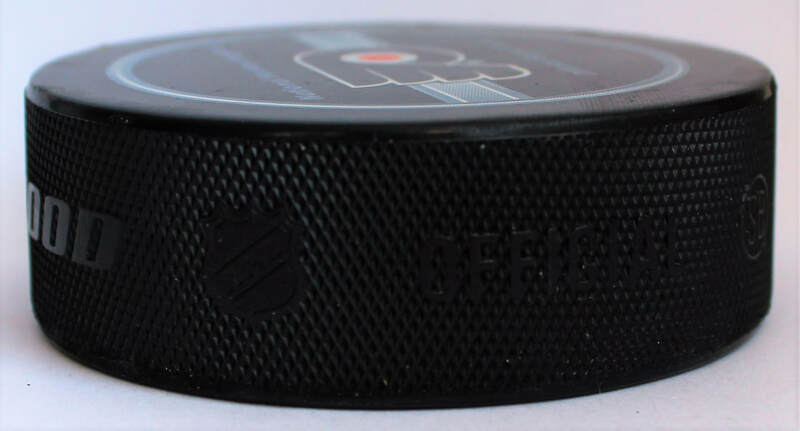 The puck was acquired by PenguinsChronicles.com ​​from a private collector on January 22, 2018. The puck was part of the Philadelphia Flyers-MeiGray Group Game Used Authentication Program. 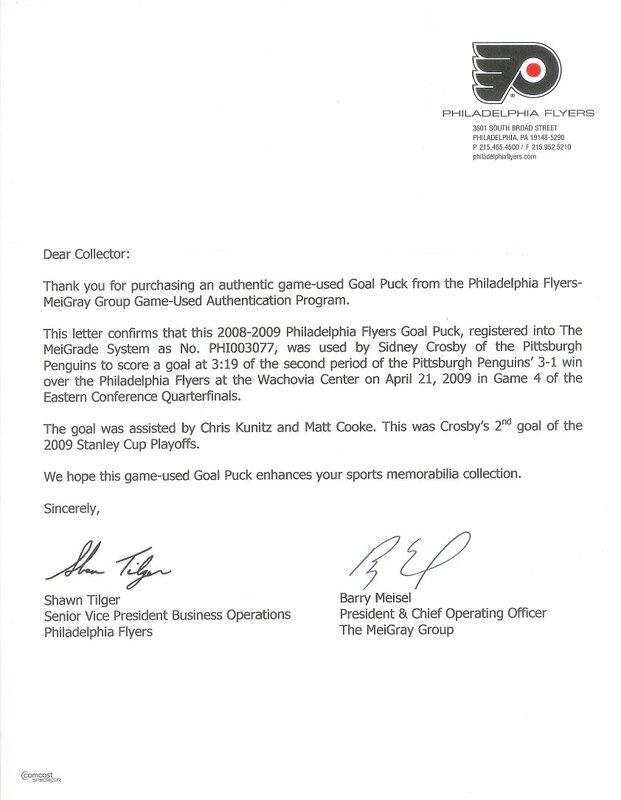 A Letter of Authenticity signed by Shawn Tilger, Senior Vice President Business Operations of the Philadelphia Flyers, and Barry Meisel, President & Chief Operating Officer of The MeiGray Group, was included with the puck.